Relations between Da’wat e Hadiyah and the Iranian Scholars date back to 15 years which gradually consolidated by the bilateral visits. Muqaddas Maulaa Saiyedna Taiyeb Ziyauddin Saheb RA envisaged the fruitfulness of Cultural and Educational relations with Iranian Scholars during his time. Even his Iran visit was planned but we could not make it due to his health. 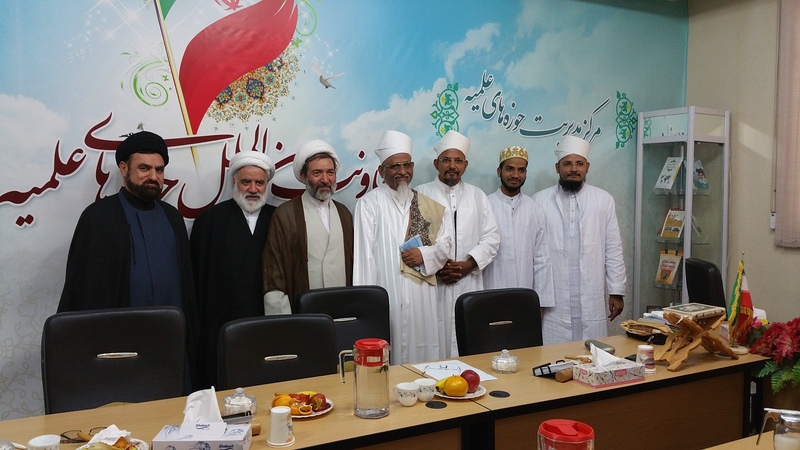 However his dream came true recently when 45th Da’i e Mutlaq al-Fatemi al-‘Alavi Saiyedna Abu Sa’eed il Khayr Haatim Zakiyuddin Saheb TUS visited Iran on the invitation of University of Religious Denominations, Qomm. It planned Cultural, Educational and Scholarly visit. Huzoor e ‘Aali TUS was accompanied by Mukaasir ud Da’wat and Ra’s ul Hudood. Shahzaada Sa’eed ul Khayr Bhaisaheb joined in the Khidmat of Aqaa Maulaa in Qomm who is pursuing his Bachelor studies in Arabic Language and Literature in al-Mustafaa International University, Qomm. He is about to complete his Bachelorship this year as he has maintained the distinguished position of “The Student of the Year”. Huzoor e ‘Aali TUS met different scholars and heads of various Institutions. Eloquent Persian language of Sa’eed ul Khayr Bhaisaheb astonished the scholars as to how can a student from India speaks Persian language so fluently. However, Huzoor e ‘Aali TUS conversed in Faseeh o Baleegh Arabic and fluent English with the Heads of Institutions. The Tareeqah of Saheb e Da’wat in choosing in Arabic, Persian and English languages as per the requirement surprised everyone especially the University Heads and Officials. Huzoor e ‘Aali TUS visited Daar ul Hadees – one of the most important institutions of Hadees Studies in Qomm. We introduced the literature of our Aimmat Faatemiyeen SA and Du’aat ul Mutlaqeen RA – an important contribution of Hadees Studies in the History of Islam. Huzoor e ‘Aali TUS visited University of Religious Denominations in Qomm. Students got a chance to interact with Aqaa Maulaa in a conference where we introduced our Community and Literature. We explicitly explained the difference in the Succession of Aimmat Faatemiyeen SA and Du’aat ul Mutlaqeen RA with other sects. Huzoor e ‘Aali TUS visited al-Mustafaa International University and met the Principal who exclusively invited the students of Alavi Bohra Community to come for their studies in Iran. He emphasized that Iran is open to the students of any country and belonging to any sect of Islam. Huzoor e ‘Aali TUS met Aghaa e Shahristaani who is the son-in-law of Ayatollaah Sistaani – Iranian representative in Najaf. He arranged the special visit for Aqaa Maulaa for the exclusive museum of gifts presented to his father-in law by different nations. Huzoor e ‘Aali TUS met Ayatollaah al Qommi who is next to His Highness Rahbar e Aa’zam Ayatollaah Khameini at his office. He was surprised to know about the history of Alavi Bohras and its micro minority status. 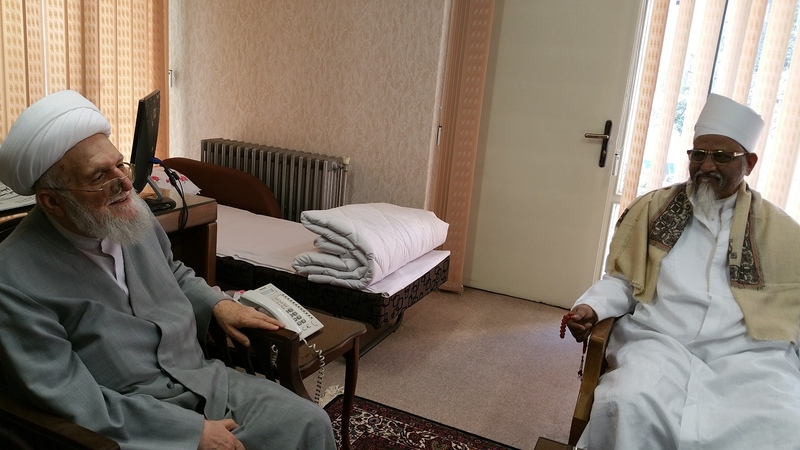 Huzoor e ‘Aali TUS stayed in Qomm for 4 days and in Tehran for 2 days. Aghaa e Mir Jalaali planned the Itinerary of Tehran for Huzoor e ‘Aali TUS. Out of the busy schedule of meetings Huzoor e ‘Aali TUS also met Former President of Iran Dr Mahmoud Ahmadinejad at his office. It was a historic meet in which Huzoor e ‘Aali TUS introduced Alavi Bohra Community to him and stressed the uniqueness of Alavi Bohras in respect of Education and Culture. He was moved by the recitation of Makhsoos Bayt of Moharram ul Haraam – “Khayr ul Anaam e Mohammadun wa Waseeyohu…”. Huzoor e ‘Aali TUS did Du’aa for his return to the Presidency as Iran saw major forward leap in the Infrastructure and Nuclear Prowess. 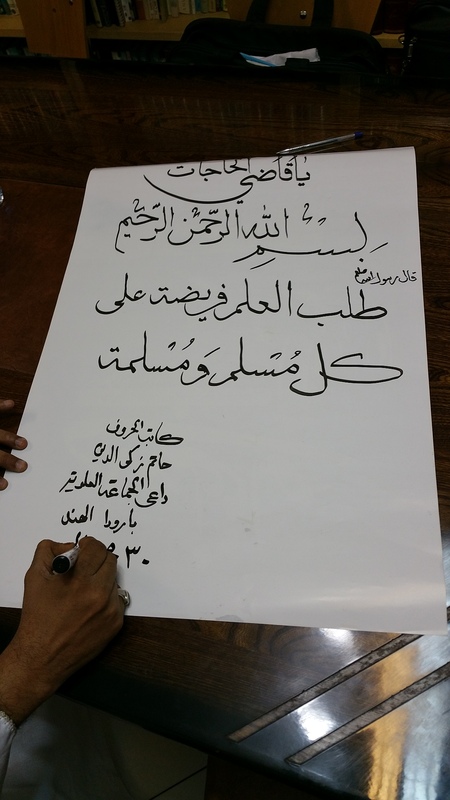 He presented Hadiyah Faakherah to Huzoor e ‘Aali TUS. Saiyedna Haatim Zakiyuddin Saheb TUS is the first Da’i al Mulaq al ‘Alavi at Taiyebi to personally visit a nation and meet scholars and heads of institutions. Huzoor e ‘Aali TUS as a Spiritual and Temporal Head of the Alavi Bohra Community is the first Da’i e Mutlaq to discuss everything open heartedly with their counterparts – a fact even accepted by the scholars and heads equally. They haven’t witnessed a meeting with a Spiritual Head in such cooperative way. Whenever a delegation from other countries visits Iran they provide a translator to communicate properly but during Huzoor e ‘Aali TUS visit we did not require any translator. On the contrary we told them to communicate in the language of their choice. Huzoor e ‘Aali TUS was fluent in Arabic, Mukaasir Saheb and Ra’s ul Hudood were fluent in English and Sa’eed ul Khayr Bhaisaheb was fluent in Persian language. 7 Du’aat ul-Balaagh ul Akrameen RA are from Iran-Faaris who migrated to Misr in the Hazrat e Imaamiyah and wrote important Books of Shi’a Isma’ili Literature of Esotericism and Exegesis. These Du’aat were the torch-bearers of Isma’ili Faith and Dogmas. This fact was unknown to Iranian Scholars which we thoroughly explained to them. Wherever Huzoor e ‘Aali TUS went he wrote “Bismillaah” and his special comments with his Dast e Maymoon in Khatt e Jali. This ba-barakat ‘alaamat amazed all because of its calligraphic splendor. 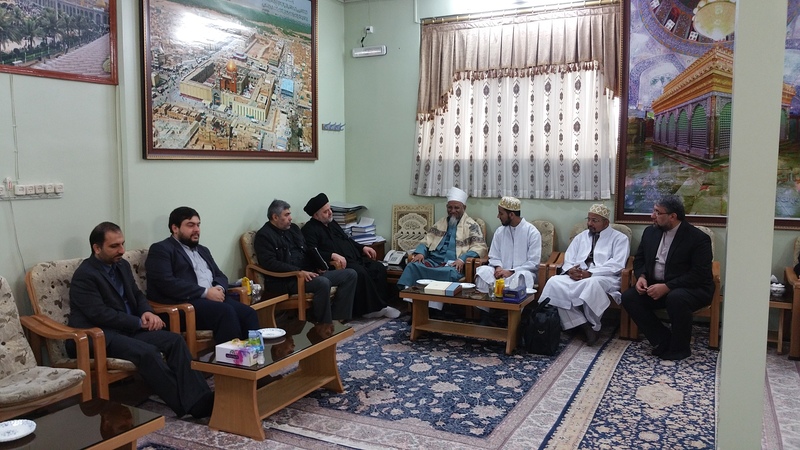 Every meeting and mulaaqaat was centered on developing bilateral literary cooperation and eliminating the misconceptions by getting together and carrying out healthy discussions between Shi’a researchers and Alavi Bohras. In this regard the first step is publishing the only work on the History of Bohras in Persian Language by Aghaa e Mir Jalaali. Lisaan ud Da’wat il ‘Alaviyah generated a great pull and interest among scholars when Huzoor e ‘Aali TUS gave a mukhtasar speech on ‘Aql and Nasf. In most of the gathering Huzoor e ‘Aali TUS explained his points to Sa’eed ul Khayr Bhaisaheb in Lisaan ud Da’wat which scholars listened carefully and attentively. They then said that the lisaan which you speak has 50% Persian words. They expressed their readiness in exploring the richness of Lisaan ud Da’wat.